After two weeks of traveling and about ready to fall asleep after my first full day of work...what do I find in my mailbox but a package from the XMarvelous Xmichra. One of the great things we have in common (besides both having outstanding blogs) is our affinity for dancy techno music....we just can't figure out why the rest of the world isn't in love with it either. 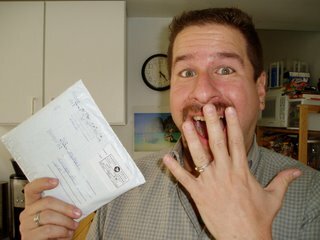 Here's how excited I was about my package! Yay you! Packages are exciting! YAY! It finally got there!! I seriously don't know why people do not love this music as much as you and I do.... hehe. Hope you enjoy the mixes. Some are very hard techno, some are trance.. some are old 90's stuff that I can not bare to part with. hehe. Such shocked excitement! HA! Priceless. But isn't getting a package like the most awesome thing EVER?